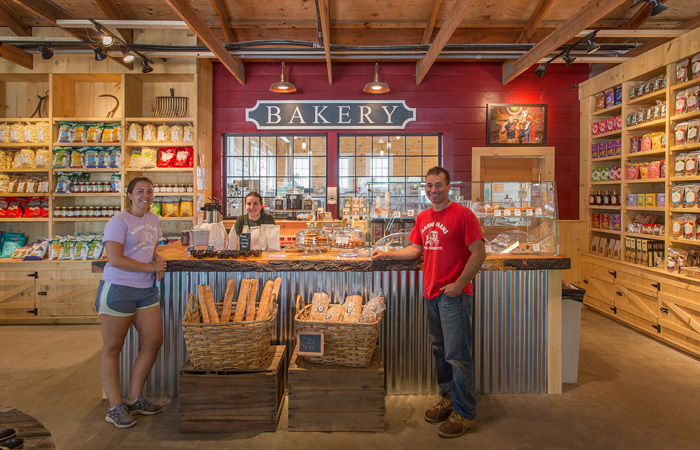 For over 75 years, North Shore residents have flocked to Marini Farm – a third-generation, family-run business – for the local produce, homemade baked goods, and neighborly customer service. As demand for the farm's diverse offerings has grown over the years, so too has the demand for extra space. That's when owner Mike Marini called on Matthew Cummings of Cummings Architects. After drawing up his initial designs, Cummings got in touch with Shawn Cayer and the Ipswich-based team just down the road from Marini Farms at Windhill Builders to partner on the much-needed addition. And that's when Cayer called up his go-to lumber supplier – Feuer Lumber. 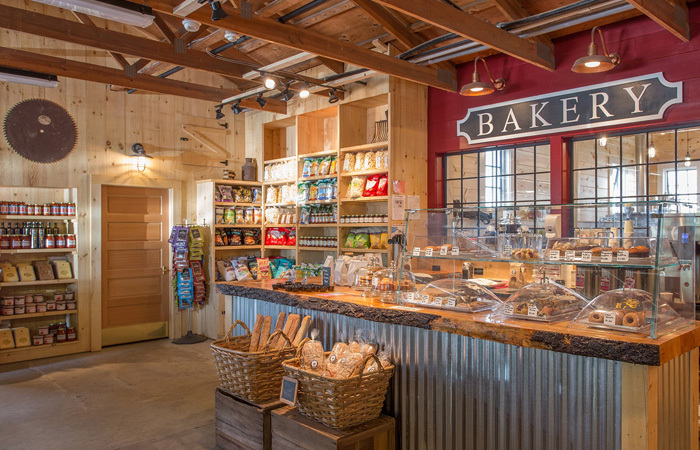 From the barn-door entrance to the rustic bakery countertops, Marini wanted this space to be an extension of the natural beauty found just outside. The goal? To renovate the retail area in order to better accommodate the ever-increasing traffic of customers, add a large scale bakery with all the amenities of an industrial kitchen, and a spacious walk-in refrigerator. While the space was needed to cater to a much larger production level in the kitchen, the goal was not to betray the rustic charm of the space itself. From the barn-door entrance to the rustic bakery countertops, Marini wanted this space to be an extension of the natural beauty found just outside. Understanding this, Cayer felt Eastern White Pine was the perfect candidate for the project. But there was a time-sensitive caveat to this project. Design and construction needed to start in the fall of 2014 and finish by the summer of 2015. Marini soon found he had pegged the perfect team for the job. Exterior aspects were done before the ground had a chance to freeze and interior construction took place during the winter. For his part, Cayer completed much of the construction in just seven weeks. Cayer notes that the clarity of the blueprints created by Cummings and quick turnaround on orders from Feuer played a hand in expediting the construction process. 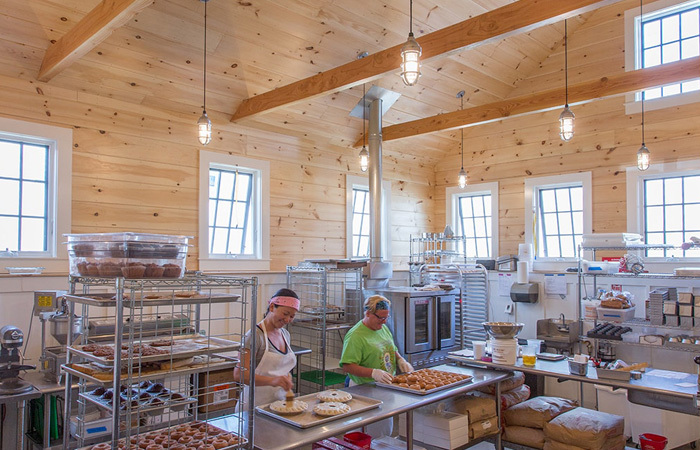 For the bakery, rough sawn Eastern White Pine was chosen for the walls and ceiling with the smooth side exposed. Rough sawn Eastern White Pine, rough side up, was chosen for the retail area to create the shelving on both sides of the bakery counter. "We could likely have found white-pine elsewhere," notes Cayer. "But we choose Feuer, as we have on many projects over the last years, because they specialize in the products that we rely on to turn our customer's vision for their space into a reality. And after we place our orders, we know they'll arrive on-time and on-spec." Cayer adds that Eastern White Pine was the best fit to match the aesthetics and purpose of the space. This option enhanced the natural, cozy feel of the farm stand without surrendering anything in terms of durability. "The band saw cut on the rough sawn lumber that Feuer provides gives a nice, consistent look to the wood," adds Cayer. "It was even more pleasing once we had it installed." Windhill is a tight-knit team that takes inspiration from their clients’ dreams to build them their dream spaces. They require the best products on the market to turn out these incredible, life-changing spaces. And in terms of sourcing lumber for their projects, they take delight in their partnership with Feuer Lumber due to the quality and reliability of their products. And Cayer finishes: "You certainly can't beat their attention to detail or the good old-fashioned customer service that we've come to expect from their team."